This one day workshop provides an overview of cold-process soap making geared to beginning soapmakers and those who would like to make soap for the first time. The workshop fee includes class lecture, demonstration & production time from 9:30am through 4:30pm; lunch, beverages and snacks; all supplies and materials needed for class (oils, butters, lye, fragrances, safety goggles, gloves, aprons, and soap mold to take your soap home) and the Workshop Workbook including classroom lecture notes, helpful online resources, and recommended soap making suppliers. 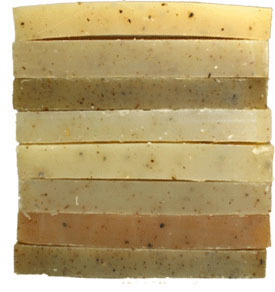 Following a short lunch break, you will make your first batch of soap. Then we’ll introduce you to the Processing phase, where we evaluate soap to determine its readiness for cutting, and demonstrate how to use a variety of soap molds, log splitters and different size bar cutters. Then we’ll switch gears and begin looking in depth at SAP values for oils and butters you may choose to work with on your own, and resources to help you create your own soap recipes. You will take home your batch of soap in its own travel mold for processing later yourself. The ‘classroom’ part of our one day workshop is over about 4:30 pm.